I’ve been thinking about perspective. 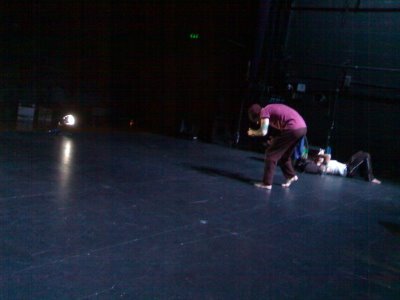 We’ve just finished performing Niche and I’ve been comforted and confronted by other people’s perspective on the work. I think I’ve made a piece that invites a particular way of viewing, an attentiveness to what’s going on in the space (a shared space of performers and audience) rather than an attempt to decode symbols that stand in for something else. Of course as I write this it sounds like I’m offering some unmediated, raw experiences and as a good student I know that’s impossible. We can’t help but view things, experience things, feel things, through the filters of prior experiences, social codes, and prevalent ideas about ourselves and our environment that organise the sensory data we receive from the world (even this idea of us separate from the world is an organising idea that shapes our thinking). So what am I asking when I invite an audience to be attentive, to notice what’s going on (the wobbles, the detail of touch, the instability of weight, the hum of the generator?) How does an audience know what matters and what doesn’t? I don’t know what matters – not in the big scheme of things. But I know what matters to me and I make work that reflects that. But knowing that my perspective is not complete I build in structures that remind myself and the audience that what I’m presenting is partial, limited and personal. I invite them to pay attention to what escapes me and my control, to see more than I can and to be delighted by the new things that are revealed in the process. And maybe I remind them that their perspective is partial too. It’s for that reason that the woman in Niche has a trajectory independent of the men. Her rhythm is not determined by me and is a surprise each evening. I have made no attempt to resolve her sharing of the space with the men, though I know how I, as audience, have created links between the men and woman. Like independent inhabitants of the city, their paths can be viewed simultanaeously from a particular perspective but the temporal connection doesn’t imply a causal relation. I’ve also reflected on perspective because this week I took Mikel’s part in the piece for performances in Liverpool and Bray. As a result I’ve seen the work from the perspective of a participant though not quite yet forsaking the external perspective I carry in my head from previous performances.